It is difficult to reconcile Abdullahi Rabiu with the world record he is believed to hold. An athletic feat or sportsman's event seems likely. But could this incredibly fit, healthy, energetic Nigerian really be the man known for having the most Guinea worms emerge from his body at one time? No one else is lining up to lay claim to his title or number: 84. In 1999, Rabiu, then a 25-year-old farmer from the small community of Kufan Ruga in northern Nigeria, was preparing to plant crops at the beginning of the rainy season - the same season when Guinea worm disease transmission is at its highest in that area - when he first noticed some blisters on his skin. Having had the occasional Guinea worm before, Rabiu recognized the blisters as containing worms ready to poke through. "I tried to remove them, but they kept coming," Rabiu said. "The worms were there one after the other until I was down completely. I couldn't work. I couldn't move because the worms were coming from so many different places." 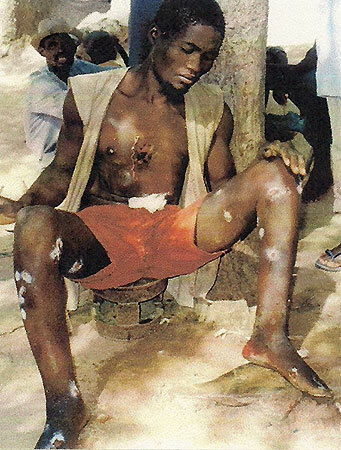 Nigeria once had the most cases of Guinea worm disease in the world. In 1988, The Carter Center and partners began working with Nigeria's Ministry of Health to eliminate the disease which is contracted when people drink water from ponds infested with Guinea worm larvae. Once inside the host, the larvae mate and mature. The female worms - which can grow up to three feet long - emerge about a year later through excruciatingly painful sores in the skin. If the infected person submerges those sores in drinking ponds, it triggers the worm to release her eggs, and the cycle repeats. Low-tech strategies like teaching communities to filter drinking water and encouraging infected people to stay out of ponds have helped the Carter Center-led campaign succeed in near eradication of the disease, evident by the plunge of cases from an estimated 3.5 million worldwide in 1986 to under 150 in 2013. In 1999, the Kufan Ruga farming community was in the midst of a Guinea worm outbreak, but no one had as many emerging worms as Rabiu. He said that whenever someone in his village died, people would start crying and shouting, "Oh, maybe it's Rabiu." And they would all rush to his house to find that he was still alive. Barely. "When I first saw him, he was in a state of unconsciousness," said Solomon Olukade, a former Carter Center field supervisor who treated Rabiu in 1999. "He could not lie or sit down comfortably because everywhere on his body were Guinea worms." Rabiu was weak, having lost a lot of blood from trying to extract the worms himself, and in great pain. 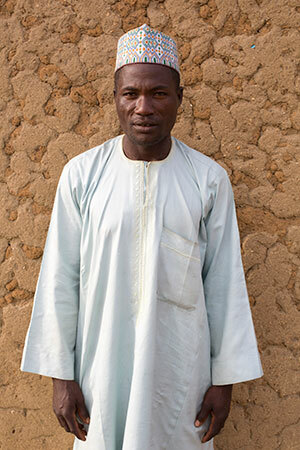 Olukade and his team of health workers used safe, sanitary techniques to extract the worms - sometimes as many six or seven from the same wound - from sunup until it was too dark to see without the headlights from their vehicle. Day after day, they carefully pulled worms from Rabiu's body, saving and counting each one, for a total of 84. After the worms were removed, Rabiu's recovery was dramatic. "The next year, I was back to work on my farm," he says - back and better than ever. When he turned out the biggest harvest in his community in 2000, villagers declared him "Farmer of the Year." He never had a Guinea worm again. "It was hard to believe that one day this disease would be gone out of our communities forever," said Rabiu. "But today, people in Nigeria are no longer crippled or disabled because of this disease. They are back to their normal business and are carrying on with their lives." In 2008, Nigeria interrupted transmission of Guinea worm disease, and in 2013, received certification from the World Health Organization for having eliminated the disease countrywide. Jump to 2014. Olukade and Rabiu hug and clap each other on the back, talking like school buddies at an overdue reunion. It's been 14 years, and The Carter Center has invited Olukade along as a team documents Rabiu's experiences. Olukade is retired now. Rabiu is married with fourteen children, and is unrecognizable, says Olukade, as the frail, failing patient he once treated: "I was looking at him from far off. I said, 'Could it be, this is Rabiu?'" It is - healthy, happy, and, as he tells Olukade, thankful.